In general, the Small Greek Domestic Dog is larger in size than the Alopekis. The breed has dropped ears. Two coat types occur, long and shorthaired. The longhair is the most common now and also the most commonly represented type on ancient artifacts. The shorthaired type seems to be an intermediate form between the Small Greek Domestic Dog and the Alopekis. Currently, the shorthaired variety is unmentioned in the provisional standard, but it is numerous enough to one day be accepted. An ancient breed of the Hellenic (Greek) dog, Meliteo Kinidio, the Small Greek Domestic Dogs is an ideal companion, extremely expressive and highly perceptive. It is an adept hunter of small game and birds. It needs a daily pack walks to burn mental and physical energy. Make sure you are this dog's firm, confident, consistent pack leader to avoid Small Dog Syndrome, human induced behavior problems. Always remember, dogs are canines, not humans. Be sure to meet their natural instincts as animals. If you are not this dog's pack leader, he can become fearless and territorial and possessive of his owners. These are not breed traits, but rather behaviors brought on by the lack of a true human leader. These dogs should be taken on daily, long walks. 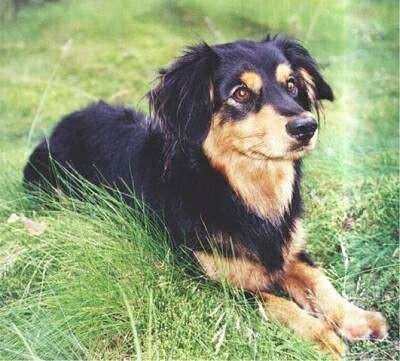 At one time the Alopekis and Small Greek Domestic Dog were considered to be different types of the same breed. This has since changed and provisional standards have been written for each breed since both breed true to type. In terms of numbers, this breed is more common than the Alopekis, although both breeds would be the easiest and most likely breeds to be exported from Greece and established elsewhere. Due to their small size, people seem to instinctively keep them as companions, sometimes for generations. This is a tradition that goes all the way back to ancient Greece. A large number of images on ancient friezes, pottery and amphorae show this breed as a companion to women and children. Meliteo Kinidio translates to Honey (Small) Dog, probably due to its sweet (like honey) disposition and the name Alopekis translates to "Fox," due to its foxy looks and size. Bo the Small Greek Domestic Dog—her owner brought her from Greece to the UK when she was just 3 months old. Bo is described as friendly, calm and very sweet. "Jesse is originally from Kardamena, which is a small village in the island of Kos in Greece. 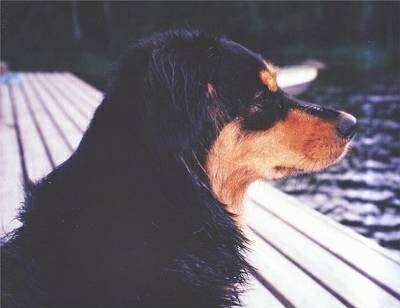 I met Jesse there when he was 6 weeks old and took him to Finland with me when he was 9 weeks old. Now Jesse is almost 5 years old and I never regretted taking him with me from the pet shop. He's 15 inches (38 cm) high and weighs about 35-36.5 pounds (16-17 kg), (he should be 30.5-31.5 pounds (14-15 kg)). He's a bit bigger than most of the similar kind of dogs I have seen in Greece and his fur is thicker, probably due to the climate he's living in now. His front legs are twisted like a Dachshund. He has a huge tail. 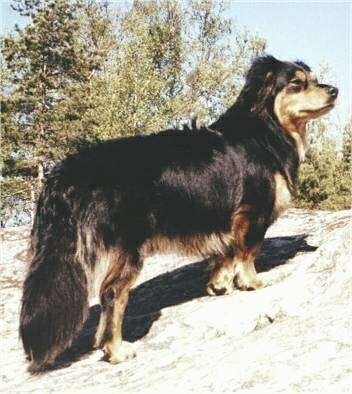 I had seen an article about Greek dogs in a Finnish dog magazine and there was a picture of a dog that looked a lot like Jesse. It was called a "Small Greek Yard Dog" and if translated from Greek the name would have been something like a "small fox"—which they look like with their big tails. I have also seen a dog like Jesse being called "Greek Small Domestic Dog,"
"Jesse is very friendly to people he knows and he loves kids (all ages, including babies; he's very worried if he hears a baby crying). However, he seems to be a guard, too, and growls and barks on strangers especially if they behave in a way he doesn't like. He guards a bit indoors too, but mostly he loves being rubbed. He's a bit reserved with other male dogs. However, he loves female dogs and usually likes young males if they are smaller than he is. If he could choose he would be living in a house with a yard and would just lie there and watch the world around him. He's a calm dog, but turns into a puppy when he gets a ball or a stick. He could play with the ball for hours and will play alone, too. He's very patient when he searches for the ball from the bushes. He also loves to swim and at the time of the year after the ice is gone he seems to smile when he sees water he can swim in. He hunts a little, but mostly it's just for fun to make birds fly; he's not very patient in chasing animals. He gets along with other animals very well and likes domestic animals like lambs and cows a lot. Jesse is a bit of a Shepherd too; he herds me by nipping my legs if he wants me to go somewhere." "We found our Honey (Small) Dog as a 3-month-old super affectionate pup in the top of a mountain during our Christmas vacation in Greece. We assumed that he was a wild mutt. Upon further investigation this breed can be seen in the museum amphorae paintings of hunting scenes of the classical period 300 BC. It appears these dogs did survive in direct lineage in remote mountains and islands. Even in their wild state there are no reports of bothering humans or livestock with the exception of birds, quail and occasionally chickens. 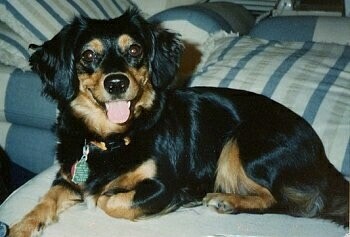 He integrated immediately with our Wire Fox Terrier and German Shepherd."